We are 2 days away from celebrating Earth Hour! Are you still searching for ways on how to celebrate Earth Hour and sustaining it for the days to come? What the world needs are people like you. If you’re shifting to a more sustainable and energy-conscious way of life, then you are more qualified to participate in this worldwide event! Here are some ways to maintain you and your family’s commitment to protecting our planet and contribute to the global environmental change. 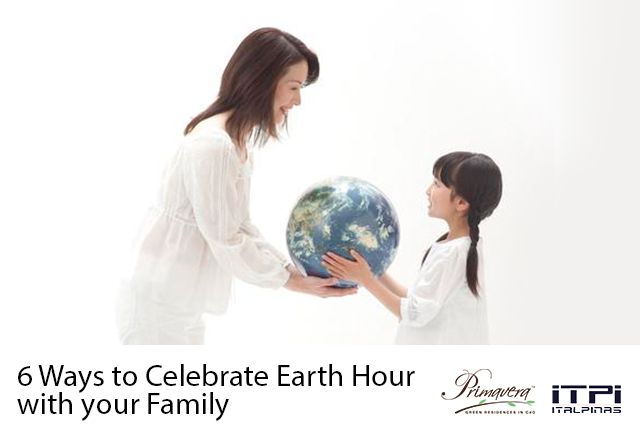 Talk with your family: This is an opportunity to talk with your family about your contribution to the Earth Hour. This way, you cannot just participate by yourself but you can also encourage your family members. Some easy contributions at home are by simply turning off the lights, schedule watching the television, charging your gadgets ahead of time, and by limiting waste as you make a positive impact on the environment. This Saturday, take this as an opportunity to be with your family as you go stargazing. Impose and save: You can set up a plan on what areas of your house where electricity can be saved. You can simply place flags or stickers on when to use these appliances or unplug your computers. Through imposing these simple discipline, turning off lights and other devices will not just save energy but could shape your family members’ character and behavior. Issue a challenge: Turn off the television and computer! Gather the family, light a candle and pull out your favorite board games. Scrabble, Monopoly, Trivia Pursuits and Pictionary are some great options. You might event notice you’ve bonded so closely that you were celebrating it past the hour. How’s that for a simple and eco-friendly family bonding? Impart wisdom to your kids: By simply calculating the ways you can save energy in and around your house can help your kids understand the impact they can contribute with their individual actions on the entire environment. You can explain the effects, savings they get, and benefits from being conscious of their electricity consumption. Through this, these steps will help them reduce the use of energy. Walk the talk: Invite family and friends over to celebrate Earth Hour together. Turn off the lights and other appliances while you watch an environmentally-themed movie. Afterwards, you can have a group discussion and write down what actions should be done. Be inspired to become an inspiration. Let’s walk the talk. Share to the world. In taking part of this global event, it wouldn’t hurt you if you post your Earth Hour experience with the hashtag #ChangeClimateChange. So, see you this Saturday as we make the world a better place to live in! Italpinas Euroasian Design and Eco-development Corporation’s (ITPI) flagship sustainable condominium development in Cagayan de Oro, Primavera Residences, fully supports the goals of Earth Hour. Being one of Cagayan de Oro’ green advocates, the green building is designed with eco-friendly features that helps reduce the residents’ electricity consumption. Do you want to know more about the Primavera Residences and its advocacies? You may click here.